The year is meaningful for its background. In 1951, England was modernizing from its class-based social structure, but remnants still remained. The red foxes were the traditional upper classes, and some old habits remained. "No, I feel so terrible. Please let me." She [Flora, the otter housemaid] paused. "Then you and Abby can spend the evening together, after she does Mr Trevayn’s room." "Bother him," Ellie said with nearly as much heat as was being applied to the soup. "I’m certain he hired a fox valet simply to annoy the master." "It can’t annoy the master much if Mr Trevayn never brings him to Tremontaine," Flora said. "He almost never visits anyway. What would be the point? I’m sure he hired the valet because he was an excellent valet." "It’s transference," Ellie said. "When he orders the valet around, he pretends it’s Mr St. Clair, I’ll wager." 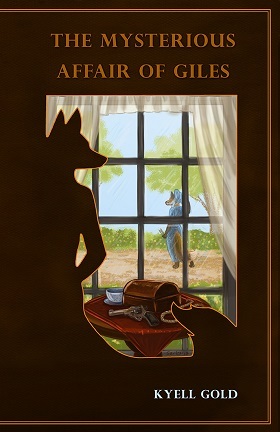 Since The Mysterious Affair of Giles is specifically an Agatha Christie-styled murder-mystery, it is probably Kyell Gold’s most funny animal furry story yet. The characters have a few animal characteristics such as fur, movable tails, flicking ears, and their sense of smell, but by its nature, all of the characters could be easily replaced by humans. However, Gold gives it enough surface furriness to satisfy most of Flayrah’s readers. Flora frowned and then bent down to the paper. "It smells like …" She looked up. "Fox." Ellie bent down as well. The trace was faint, but she caught the musky scent. "Can you tell which one?" A short time later, a middle-aged fox arrived in a white coat, and the Inspector accompanied him upstairs as well. "That’s the coroner," Miss Turner [the weasel senior cook] whispered. "The ones in my novels are all foxes and wolves," Ellie murmured. The Mysterious Affair of Giles has a cover and five full-page illustrations by Sara "Caribou" Miles. This seventh of FurPlanet’s Cupcake novellas (shorter than a novel but longer than a short story) premiered at the Furry Fiesta 2014 convention, in Dallas on February 20-23, and is now available from FurPlanet’s online catalogue. If you like traditional English murder-mysteries, and you are a furry fan, this is for you.